The Czech Embassy in cooperation with the UCL and the Embassies of Poland and Slovakia held a symposium The Ties That Bind in September 2010 to honour the participation of their airmen in the Battle of Britain and the establishment of the governments in exile in London. The symposium was held under the auspices of the Czech Ambassador Michael Žantovský, in cooperation with the Embassies of Poland and Slovakia. 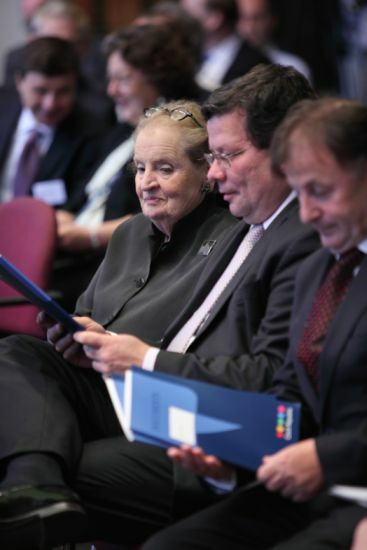 Madeleine Albright, former US Secretary of State, at present a Professor of diplomacy at the Georgetown University in Washington was the guest of honour and keynote speaker. Alexandr Vondra, Minister of Defence of the Czech Republic also attended the symposium and delivered introductory remarks in the second panel. The first panel The Finest Hour dealt with the military and political significance of the Battle of France and the Battle of Britain and the growing involvement of the exile political and military elements from Central Europe in the struggle. Greg Hands, MP held the introductory remarks. The panel was chaired by Dr Robin Aizlewood, Director of the School of the Slavonic and East European Studies at UCL. The panelists were as follows: Prof Richard Overy (University of Exeter), Dr Peter Neville (University of Westminster), Dr Martin Kovář (Charles University, Prague) and Jerzy B. Cynk (Polish Air Force Association in Great Britain) whose speech was delivered by Peter Devitt (Royal Air Force Museum London). The second block, chaired by Dr Aizlewood, was entitled The Seeds of the Future and focused on the emergence of the exile governments in London as an integral part of the anti-Axis Alliance. The speakers: Prof Robert Pynsent (UCL), Dr Martin D Brown (Richmond, the American International University in London), Dr Jan Láníček (University of Southampton), Prof Anita Prazmowska (LSE) and Dr Edita Ivaničková (Slovak Academy of Sciences). The third session The Uses and Abuses of History was chaired by the Czech Ambassador Michael Žantovský. It dealt with the current perspectives of the events of 70 years ago, in particular with some of the recent studies that aim to complete, supplement or revise our knowledge of the era. The panelists were as follows: Prof Jiří Pribáň (University of Cardiff), Dr Muriel Blaive (Ludwig Boltzmann Institute, Vienna), Dr Vít Smetana (Academy of Sciences, Prague) and Prof Vojtěch Mastný (Centre for Security Studies, Zurich). There were above 150 guests attending the symposium – scholars and academics, diplomats, UK state administration officials, Czechoslovak and Polish veterans, students, experts from the British institutions and members of Czech British Chamber of Commerce.